Monday – 23rd July 1986: Prince Andrew marries Sarah Ferguson at Westminster Abbey. As a wedding present (of sorts), the Queen grants them the title of Duke and Duchess of York. Tuesday – 24th July 1987: At the High Court, Jeffrey Archer wins damages of £500,000 in his libel case against the Daily Star. 14 years later he would be convicted of perjury and perverting the course of justice for falsifying an alibi during the 1987 trial. He would eventually repay the £500,000 to the Daily Star. Wednesday – 25th July 1859: Vauxhall Gardens – a popular ‘pleasure garden’ based in Kennington, South London – are closed for good, following a couple of decades of disuse. Thursday – 26th July 1994: A car bomb explodes outside the Israeli embassy in Kensington, injuring 20 people. Later that night, a second car bomb explodes outside the headquarters of an Israeli organisation in North Finchley, North London, injuring a further 6 people. Friday – 27th July 1694: Having been established to manage the nation’s finances (via a loan of £1.2 million to the government), the Bank of England is granted the Royal Charter. Savoy Court is a rather small road just off The Strand that serves as a forecourt to the Savoy Hotel and the Savoy Theatre. Nothing hugely unusual there. You can see Savoy Court, in all its tiny topsy-turvy glory, here. To be fair, that particular throwaway comment was more a reflection on the enduring boredom (and persistent pettiness) of our geography teacher than an accurate indication of the complex meteorological systems that affect the nation. Nonetheless, after last week’s severe and utterly schizophrenic weather, we are beginning to think that our teacher may have had a point. Right now the subject of the nation’s weather (if not specifically London’s weather) is headline news, and the cause of much speculation and discussion. We’re not sure that we can add much to that this week – so let’s just say that it’s going to be quite rainy, and also quite sunny, and leave it at that. 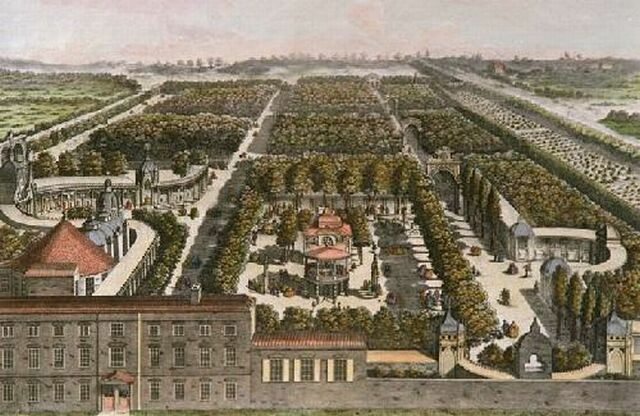 Picture of Vauxhall Gardens by Samuel Wale.